For those of us who only came to craft beer in the past decade or so, Sierra Nevada will always occupy a certain special place. For those of us who only came to craft beer in the past decade or so, Sierra Nevada will always occupy a certain special place. Even in the earliest days of the UK’s craft awakening, the presence of Sierra Nevada’s signature Pale Ale was the hallmark of a good bottleshop or bar, alongside other US luminaries such as Anchor Steam and Goose Island. These breweries weren’t just responsible for helping introduce American-style craft to the UK though. Sierra Nevada has inspired a generation of US drinkers and brewers, and its founder Ken Grossman is one of a small handful of individuals who can legitimately claim to have lit the first sparks of craft in the tinderbox of America’s (at the time) parched domestic beer scene. The path that led him here started when Ken was in high school, where he was inspired by a local man named Cal, the father of a close friend, retired rocket scientist and avid home brewer. Ken and his teenage friends use to while away their weekends hiking and biking around the Sierra Nevada mountain range, or in and around Cal’s garage, where there was always some interesting project sparking or bubbling away. When Cal noticed his tools and pieces of brewing equipment going missing, it didn’t take long for fingers to point at the young Ken Grossman. Being more of a mentor than an authoritarian figure, Cal reasoned the best way to end Ken’s covert experimentation was to make it official, so he took him under his wing and began teaching him the art of brewing. Ken continued this hobby, gradually honing his skills (much to the delight of his friends) all the way through high school. After graduating in 1972, Ken discovered the town of Chico while exploring southern California with some friends; he instantly fell in love with the small university town and decided to make it his home, taking a job in a local bicycle shop, Pullins Cyclery. Sierra Nevada’s early days were far from easy. Alongside brewing, cycling had always been the second great passion of Ken’s life. The brother of a professional cyclist, riding and working on bikes had fulfilled the same love for engineering that continues to drive Ken to this day. After a few years, Mr Pullin was so impressed with Ken’s passion and work ethic that he began grooming him to eventually take over the business. Torn between his love of bikes and yearning to brew, Ken eventually took the plunge and in 1976 left Pullins to open his own home brew shop. He had a great couple of years sharing his knowledge with the small but growing Chico home brew community. But, like all entrepreneurs, he was soon keen to take the logical next step: opening his own brewery. So he sold the shop and, together with business partner Paul Camusi, in 1980 established Sierra Nevada Brewing Co in a small warehouse a few miles north of its current Chico home. It’s worth remembering at this point just how dismal the American beer scene was in 1980. 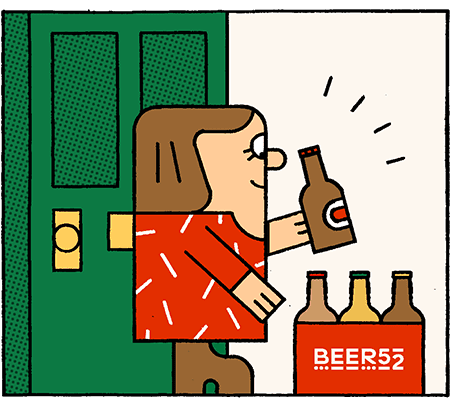 Aside from a few other pioneers (who weren’t yet even on the radar outside their home towns), people’s tastes were dialled in exclusively to light, characterless mass-produced American-style lagers. Hardly surprising then that Sierra Nevada’s early days were far from easy. Ken’s first hurdle was as basic as finding the right kit on which to brew his first beers. As small-scale commercial brewing was pretty much unheard of, the only brewkits available were either for homebrew or the country’s macro-brewing giants. Undeterred, Ken took a couple of welding courses at the local community college and – having driven around the country procuring old dairy, old car-wash pumps and other second-hand equipment – set about building a 10-barrel brew house from scratch. The second more fundamental problem was that most people really didn’t like the beer. It was strong, flavourful and packed full of bold, bitter American Cascade hops – the polar opposite of what they were used to. Ken didn’t have a budget for advertising or marketing, so relied on word of mouth and the leather of his own shoes to get the beer out there, sold to stockists literally from the back of his car. Then two quite distinct things happened which transformed Sierra Nevada’s fortunes in a relatively short space of time. The first was an unsolicited story in the San Francisco Examiner, by a journalist called Michael Castleman, who happened across a bottle of Ken’s Pale Ale and was instantly converted. This put Sierra Nevada on the map for food and drink lovers in the entire bay area, creating an overnight buzz that would steadily gain momentum over the following months. At around the same time, the beer was also discovered by a father visiting his daughter at university in Chico. This father also happened to be the beer and wine buyer for Safeway in Northern California (for UK readers: don’t panic, Safeway is quite different in the US) and become hell-bent on getting Sierra Nevada onto the shelves of as many stores as he could. With momentum really beginning to build, and it was becoming abundantly clear that Ken’s Heath-Robinson brewhouse would soon be obsolete, he got word of a defunct German brewery looking to sell its all-copper 100-barrel system for the price of scrap. But there was a catch: Ken would have to fly over to Germany, take the system apart, package it up and ship it back himself. Unphased, he boarded a plane and proceeded to do just that. warehouse for five long years. Nonetheless, by 1989, Sierra Nevada had raised the money to buy a plot of land, build a brand new brewery and set up the 100-barrel copper kit that remains in place to this day (the controls of the panel board are still in German) and continues to brew around 20% of Sierra Nevada’s total output. The same year, Paul Camusi decided to sell Ken his share of the business, leaving him the sole owner (he still is). Within four years, Ken was already running the system at full capacity, producing 100,000 barrels of beer a year. No longer a microbrewer, he was now in American terms a true ‘craft brewer’. The brewery continued to expand and, in the mid-2000s Ken realised he would soon need a second site to meet not just domestic but international demand for Sierra Nevada beers. In 2013, he broke ground on the site of a new brewery in River Mills, North Carolina. Where Chico is a bit of a warren of expansions, extensions and rearrangement (the main ‘shop floor’ has been moved four times over the years), the new brewery is the product of all those lessons learned. Featuring a large restaurant, tours and a 1200-person amphitheatre, it’s Ken’s “dream brewery” and – like Chico – a case-study in sustainable brewing (see box-out). Today, Sierra Nevada is the seventh largest brewery in the United states, and the third largest craft brewery. Ken continues to play an active role in the day-to-day running of both breweries, and can most often be found talking to staff and getting his hands dirty. Going against the grain in these days of investment and acquisition, Sierra Nevada is fiercely proud of its status as a 100% privately owned company and, with Ken’s two adult children – Sierra and Brian – both taking on roles at the brewery, it looks set to continue ploughing its own furrow under the next generation too. When Ken first started selling Sierra Nevada beer from the back of his car in the 1980s, he would ask bars and restaurants to save the bottles, which he would then collect, sanitise, relabel and reuse. Sustainability has always been at the heart of the brewery’s ethos, and remains so to this day. Most breweries vent off the carbon dioxide produced during fermentation, then buy in tanks of the gas to give their beer its fizz at the end of the process. Seeing this as wasteful, Sierra Nevada uses state-of-the-art carbon capture to store its fermentation gasses for later injection into the beer. Since installing the system, the brewery has reduced its need for third-party carbon dioxide tanks to nearly nothing. An aerial view of the Chico brewery reveals roofs covered with photovoltaic panels – 10800 in total – which take care of 25% of the brewery’s power needs. Combined with 10 micro-turbines around the site and 10 newly-installed Tesla batteries for balancing energy supply and demand, Sierra Nevada is well on the way to becoming energy independent. All compostable waste from the brewery’s bar and restaurant is fed into an on-site ‘hot rot’ composter; a self-contained, mechanised composting system that takes food waste in at one end and produces dry, odourless but extremely rich compost at the other. In addition, fat from the restaurant’s fryers is put through a separate process to produce clean biodiesel for the brewery’s small fleet of tractors.